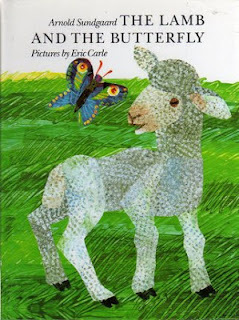 Sundgaard, Arnold and Eric Carle The Lamb and the Butterfly 32 pgs. Scholastic Books, 1988. $17.99. PICTURE BOOK. A lamb and a butterfly meet one day and discuss their very different lifestyles. The butterfly says that it flits one way while his mother flies another. The lamb, on the other hand, stays right by its mother. Each feels it has the better way of life, but when they go their separate ways they have a better understanding of other ways to live. 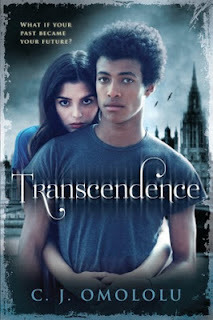 Cello prodigy Cole has been experiencing disturbing visions of different lives in different centuries, but when she faints after one episode and ends up in the arms of a mysterious boy, she soon learns the source of these visions. Not only is this not the first life she has lived, but someone from her past has traveled to this life, intent on revenge for an act of betrayal she can't even remember. 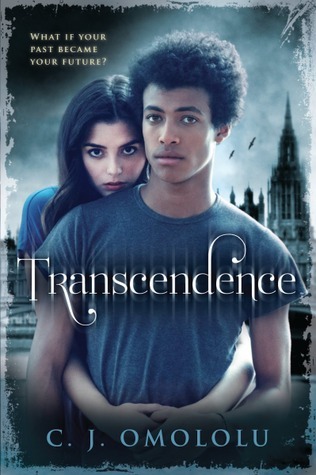 Transcendence is a suspenseful, intriguing start to a new series. With its blend of mystery, supernatural powers, villains, and cute boys, this one should keep many students interested. I loved that Omololu kept me guessing and threw in a few surprises all the way up to the end. Although a sequel releases soon, I was happy to see that this one had a satisfying ending with only a few loose plot threads -- enough to make me want to read the next in the series, but not so many that I felt cheated at the end. The sexual content pushes PG-13, and the book contains moderately detailed descriptions of several murders, so it may be preferable for older high school students or those in public library settings. M.T. 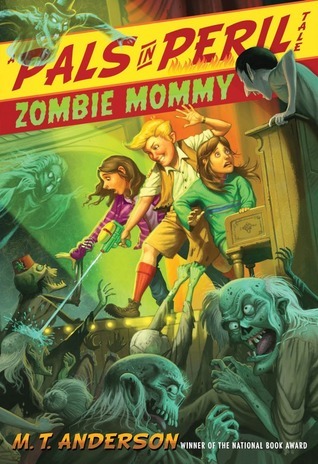 Anderson and Kurt Cyrus Zombie Mommy: A Pals in Peril Tale 220 pgs. Beach Lane Books, 2011. $6.99. Content: PG. This installment of the Pals in Peril series focuses on Lily, whose mom is terrified because Lily has been appearing in books lately and, well, you know what happens to the mothers in children's books: they die. Concerned that she's in mortal danger, Mrs. Gefelty goes to Todburg, NY, which has been declared the undead capital of the U.S. Unfortunately, "undead" refers to the overwhelming presence of zombies, vampires, and ghosts, NOT living forever. She comes back a changed woman -- one who can't even remember what her own daughter looks like. Disturbed, Lily and her friends embark on a quest to return Mrs. Gefelty to normal. What follows is a hilarious and goofy romp that doesn't even try to be realistic -- which is part of the fun. Filled with tongue-in-cheek asides by the author, a giant tarantula that keeps showing up just when it's been forgotten, and a laughably snotty cousin, this is a book that should appeal to many pre-teens. Although this can work as a stand-alone novel, the blatant and often very specific references to past episodes (to the point where the author frequently mentions his earlier book titles as sources of particular adventures) became very annoying. Perhaps reading the other books in the series first will make those references easier to gloss over. Listed as ages 10 and up. Schmitt, Michel-Yves Illustrated by Caut, Vincent Where’s Leopold? Your Pajamas are showing! 40 pgs. Graphic Universe, 2013. $6.95. Content: Language: G (0 swears); Mature Content: G ; Violence: G.
One day Leopold discovers he can make himself disappear, which is cool, but his clothes still show! He sister finds out and is a bit jealous, but soon finds out how it can benefit her, and also be totally annoying too. 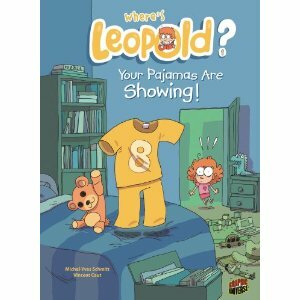 Things are even sillier once Leopold figures out how to make his clothes disappear too! This was an okay graphic novel. The plot kind of peters out in an odd way. Also, the characters turn yellow when they are mad/shocked, which was confusing, I thought maybe they were getting new super powers. The artwork is ok. The storyline was pretty much exactly what a real boy would think and do, given the power of invisibility –so students will relate to that and laugh a lot. EL - OPTIONAL Reviewer: Stephanie Elementary School Librarian & Author. 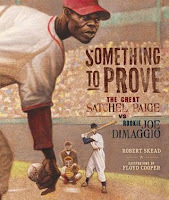 Something to Prove: The Great Satchel Paige vs Rookie Joe Dimaggio 32 pgs. Carolrhoda Books, 2013. $12.71. Content: Language: G (0 swears); Mature Content: G ; Violence: G.
The New York Yankees wanted to put a potential player to the test, but none of their own pitchers were good enough. So they brought in renowned African American pitcher Satchel Paige. It was 1935 and this was a time when African Americans were not allowed to play in the Major Leagues. 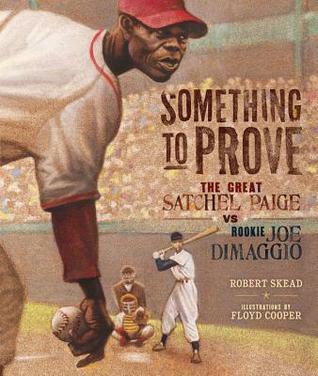 Will Satchels expert skill and creativity help Joe DiMaggio get his lucky break? Not being a sports fan in the slightest, I was none the less incredibly intrigued to learn about segregated baseball. I am constantly surprised by the insidiousness of racism. I think baseball fans will be fascinated with this story, and to be honest, you better know your baseball terminology or this book isn't going to make a lot of sense. The illustrations are a fantastic grainy red filtered style that are like a warm memory. Elementary –ADVISABLE Reviewer: Stephanie Elementary School Librarian & Author. Grogan, John and Illustrated by Cowdrey, Richard Marley and the Great Easter Egg Hunt 40 pgs. HarperCollins, 2013. $9.44. 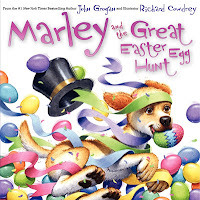 Content: Language: G (0 swears); Mature Content: G ; Violence: G.
Marley the dog is determined to find the special big Easter egg during this years Easter egg hunt. He finds a bunch of little eggs, then a whole lot of trouble, and soon is so messy that he looks like an Easter egg himself! This is a cute holiday book. Focus is on the egg hunt, no religious aspects are included. The illustrations are bright and varied. Students will be drawn to the mischievous and adorable dog! EL - ADVISABLE Reviewer: Stephanie Elementary School Librarian & Author. When Wilma Tenderfoot and her dog, Pickles find a “pickled” body preserved at an archaeological dig, it’s time for a new case. What the young apprentice detective and her dog don’t know is that her archnemesis, Barbu Danvers is back and plans to uncover the secret before she does. The clues include the mummy’s journal, a gold key, and stories of Gold, but will Wilma figure out what the clues mean before Barbu? This mystery is suspenseful and keeps the reader’s attention through many twists and turns. This eccentric, slightly “off” detective will keep girls reading and laughing out the whole way through. El (4-6), MS. ADVISABLE. Jessica Moody, Library Media Specialist, Olympus Jr. High. When Jack gets hit by a car, he collapses and almost dies on the hospital operating table. When he wakes up, he realizes not only is he not in Belleville, Indiana anymore, but a secret island. Professor Bhegad, the head researcher, claims that Jack and the other 3 kids, Marco, Aly, and Cass, have all inherited an ancient Alantean gene. The gene makes them all inherit superpowers, but without seven specific artifacts, the four will die within about six months. When Jack decodes the clue left by the original owner of the island, he realizes that he may hold the very secret to finding one of those artifacts. There are other forces at work, however, that are interested in the same items that have dastardly plans in mind. Can the four teens find the artifacts before their time runs out? Will the y be able to stop the object from falling into the wrong hands? The adventure takes a while to pick up, but the mystery more than makes up for it. The characters are likable, well-rounded, and befitting of the task before them. Readers who like books like Lightning Thief by Rick Riordan or books with superpowered characters will enjoy reading this book. EL (4-6), MS. ADVISABLE. Reviewer: Kira M, Youth Services Librarian, WHI Public Library. Harper, Charise Mericle and Illustrated by Shea, Bob Wedgieman to the Rescue (Adventures of Wedgieman Book #2) 48 pgs. Random House Books for Young Readers, 2012. $11.55. Content: Language: G (0 swears); Mature Content: G ; Violence: G.
There is a new bad guy in town. Larry. But he decides to call himself Bad Dude. He wants to destroy playground equipment and cause trouble. Will Wedgieman save the day? Will he be able to help children eat their vegetables? Will bad dude (or doodie if you pronounce it like a 1st grader) get a wedgie of his own? A hilarious second book in a series! This is some quirky writing, and a super fun read. Students will love the further pronunciation errors turned into jokes. I love the random sentences inclusion. Unique and funny. Reviewer: Stephanie Elementary School Librarian & Author. Meyer, L.A. Viva Jacquelina! 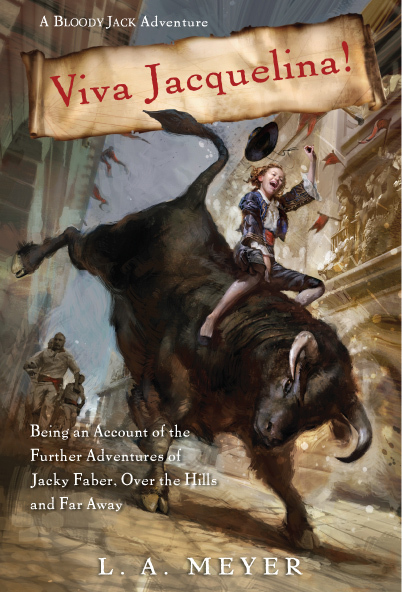 (A Bloody Jack Adventure Book #10) 368 pgs. Harcourt Children's Books, 2012. $11.35. Content: Language: G (2 swears; many borderline); Mature Content: R (or close enough for parents!) ; Violence: PG13. Jacky is a world traveling adventurer. In this book she is sent by the British to spy on Spain during wartime, where she sees’s action in battle. She spends a lot of time posing for and working with the artist Goya. Then she spends some more time in battle before joining up with the Gypsy’s. That is the worse summary I have ever written. No one expects a 10th book in a series to be a read alone –this one was nearly impossible to follow, myself lacking the foundation of the previous books. With that limitation in mind, this story was all over the place and was filled with references to past books, adventures, characters, and its historical fiction setting. I found it extremely annoying that every man in sight was all over Jacky like staticy sock. Yes, Yes, we get that she is talented, extremely vivacious, and beautiful. The writing straddled the border between bawdy and rated R, with enough sexual innuendo to probably warrant the author a new contract for action adventure romance novels. HS –NOT RECOMMENDED Reviewer: Stephanie Elementary School Librarian & Author. 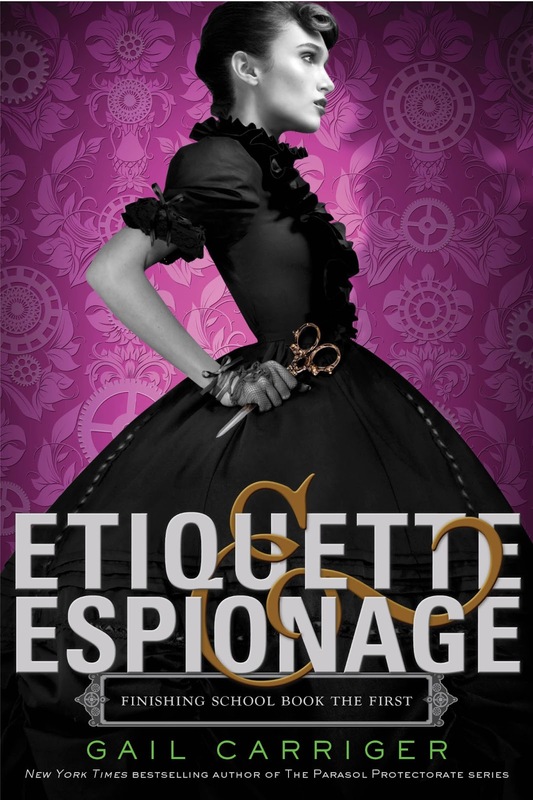 Carriger, Gail Etiquette and Espionage 320 pgs. Little, Brown Books for Young Readers, 2013. $11.13. Content: Language: G (0 swears); Mature Content: PG ; Violence: G.
Sophronia is not a proper girl, she is always getting into mischief. So her parents send her off to finishing school, where she is to become a real lady. But her parents didn't know the whole story –this finishing school teaches all the right skills plus a healthy dose of espionage and defense. Right from the start Sophronia's new education is full intrigue! This was a great Steampunk book! The concept was fresh and fun, the plot was lively and interesting. My only complaint is that I never really got attached to the main character, she isn't well developed and the narrator places us one step further back from her. Fortunately the plot is so intriguing that it carried me through. Students will love this book!! MS, HS-ADVISABLE Reviewer: Stephanie Elementary School Librarian & Author. 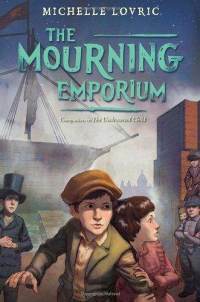 Lovric, Michelle The Mourning Emporium (Sequel to The Undrowned Child) 448 pgs. Delacorte Books for Young Readers, 2012. $14.03. Content: Language: G (0 swears); Mature Content: PG ; Violence: PG13. At the end of the first book, the bad guy, Bajamonte Tiepolo is not fully defeated, so this book starts the whole cycle over again. The two heroic children Teo, the Undrowned Child along with Renzo, the Studious Son –must face exceedingly grim circumstance in order to stop Tiepolo’s newest destructive plot. A new evil Miss Uish tries to stop them as well. This is not a read alone! This book is stuffed to the gills with references and characters, often obscure, to the first book. The long story is dark, cold, and grim –full of creative and hard to read detailed tortures and situations. While not for me, students who loved the first book may be disappointed by the repeat of the repeat situation of the first book. Who wants to beat the same bad guy twice!? 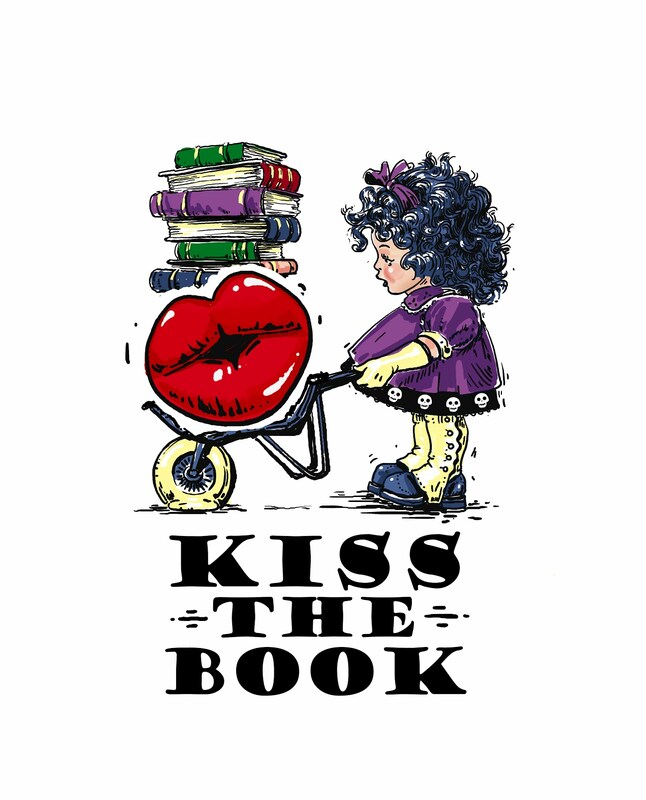 MS, HS –OPTIONAL Reviewer: Stephanie Elementary School Librarian & Author. 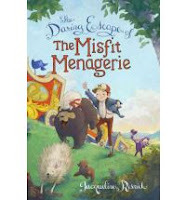 Resnick, Jacqueline and Illustrated by Cook, Matthew The Daring Escape of the Misfit Menagerie 308 pgs. Razorbill, 2012. $12.75. Content: Language: G (0 swears); Mature Content: G; Violence: G.
Four adorable animals live in an idyllic life on a farm. Smalls the sunbear and his wombat, rabbit, and dog friends are then taken away to a horrible traveling circus. Claude Magnificence and his assistants are incredibly mean and cruel. Not only to the animals but to a little boy named Bertie and a little girl named Susan, who both work there. Can the animals and the children team up and escape? I really dislike reading about animals and children being trapped in abusive situations. The majority of this long book takes place at the awful circus, so there is a lot of sadness. Maybe it’s so hard to read because the characters are well developed and the artwork is fantastic, creating characters that feel real. The themes of bravery, friendship, and moving on –are with merit. I certainly think students will be drawn to the wonderful cover art. ELEMENTARY –OPTIONAL Reviewer: Stephanie Elementary School Librarian & Author. 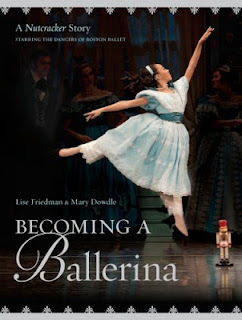 Friedman, Lisa and Dowdle, Mary Becoming a Ballerina, 44 pgs. Viking (Penguin), 2012. $18.99. Language:G; Mature Content: G; Violence:G.
This nonfiction book takes a look at the life, feelings, and experiences of Fiona, a pre professional ballerina. Fiona lives in the dance world. Most of her time is spent at school and the studio. Interspersed in her ideas and thoughts is a rendition of the Nutcracker ballet, in which she performs as Clara. Fiona expresses the blood, sweat, and tears involved in being a ballerina along with the ecstatic joys of a good performance. Although this book sheds true light on the life of a ballerina, the storyline is too choppy. The authors jump from Fiona to the stage, from 3rd person to 1st person, all in the same paragraph. Often, it is hard to know which speaker is addressing the audience. The blending of her life and the Nutcracker is a great idea, but it should flow better. 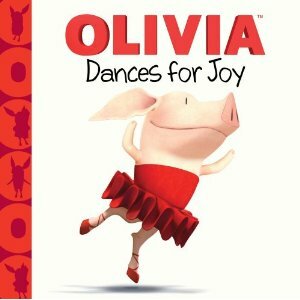 Olivia the pig wants to join a dance contest with her friends. In order to be in the contest there has to be nine dancers, so Olivia goes around and recruits the mailman, a fireman and her grandmother along with her other friends. They have a problem though because none of them dance alike. After getting frustrated that they couldn’t dance the same, Olivia’s grandmother reminds Olivia to let everyone dance the way that gives them joy. The dance team goes to the competition and everyone has a moment of spotlight and they win the competition. I love Olivia books because of the good lessons Olivia learns, my kids like Olivia too, but this story was not my favorite. I thought it was a good idea to have the dancers recognize that they all danced different, but to have them win the contest as a team seemed unbelievable and diminished the importance of them dancing as individuals. Also, the way this book was bound I don’t think it would hold up in a library with a lot of use because the pages are heavier cardstock and they are glued together, so they come apart easily. PRE-K, EL (K-3)-OPTIONAL. Reviewer, C. Peterson. Wells, Robert E. Can We Share the World with Tigers? Albert Witman and Co, 2012. $16.99 PICTURE BOOK/NON-FICTION Content: G.
This is a book about the environment and natural habitats. The book begins with an explanation that tigers might be facing extinction because of poachers and humans encroaching on their lands. 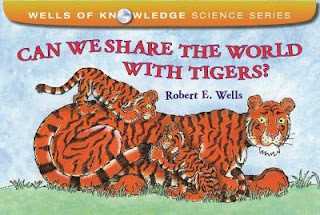 The tiger guides the reader through a basic breakdown about natural habitats and the ecosystem. There is an explanation about the population increase that has caused harm to animals and disrupted their natural habitats. There is a diagram of the different extinctions throughout the earth’s history. It ends with a plea for humans to be more conservative and to share the earth with the animals. The illustrations help simplify the scientific points being made throughout and there are little “learning circles” that add extra facts or definitions to scientific words. As with other books in this series, scientific ideas are broken down in a simple explanation that younger readers can understand making this book a good introduction to natural habitats. My complaint about this book would be when the monkey and the tiger high five each other because the monkey saved the tiger from a poacher, because it’s not consistent with the rest of the scientific feel of the book. EL - OPTIONAL. Reviewer, C. Peterson. 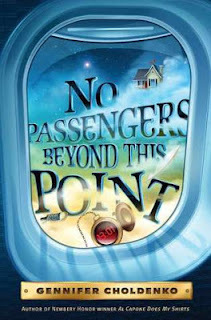 Choldenko, Gennifer No Passengers Beyond This Point, 240 pgs. Dial Books for Young Readers, 2011. $16.99. Language: G, Violence: G, Mature Content: G.
Finn, India, and Mouse are siblings flying to Colorado to live with their Uncle (Mom will be joining them at a later time, after she deals with the complications of their foreclosed home.) After they land, they are confronted with all sorts of strange and unexpected occurrences such as a taxi driver who knows them, but has never heard of Uncle Red and cell phones that don’t have any service. The three of them have to find one another and figure out a way to get to Uncle Red’s before the time on their magical clocks runs out. The story starts with good fluidity and is very easy to understand. As it continues, it becomes more convoluted and difficult to interpret what is happening. For the sake of the surprise ending, the details are never fully explained and the author leaves a lot to the reader to figure out at the finish. That could prove difficult for some Young Adult readers. I enjoyed the dedicated relationships between the siblings, but there was too much unfinished business. I would have preferred fewer details, rather than have so many unanswered components. This book has a really intriguing premise, but a somewhat sloppy delivery. 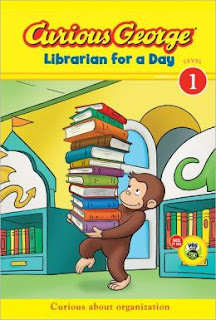 Tibbott, Julie Curious George: Librarian For a Day Houghton Mifflin, 2012. $3.99 PICTURE BOOK Content: G.
George is helping Mrs. Dewey at the library when she has to hurry away to help her book club. George helps some patrons find their books while she is away. The doorman didn’t know the name of his book, but he knew that it was yellow, so George thinks it will be easier if he reorganizes the library by color. Another patron comes and knows that his book is big, so George reorganizes the library books by size. When George’s friend, Steve, comes into the library he helps George to organize the books by subject and then alphabetically by the author. When Mrs. Dewey returns she is happy to see the library so clean and organized. In typical Curious George fashion, the cute monkey makes a mess and then learns something from his mistakes. In this book George learns how libraries are organized and that it is so people can find books easier. The illustrations are cute and the story is simple, but it says it’s for a level one reader and the words and concepts seemed a bit advanced for a beginner reader. EL (K-3) - OPTIONAL. Reviewer, C. Peterson. Scattergood, Augusta Glory Be, 199 pgs. Scholastic Press, 2012. $16.99 Content: Language: G; Mature Content: G; Violence: PG. Glory is the daughter of the local preacher and during the summer of 1964, living in the south brings with it a lot changes. Glory is excited to celebrate her 12th birthday at the local swimming pool and is disappointed by the town council’s decision to close the pool to keep out the blacks. She befriends a new girl whose mother is visiting her small Mississippi town as one of the Freedom workers, and her new friendship disrupts Glory’s old friendship with her best friend Frankie because his father is very prejudice. Glory is also struggling with her sister Jesslyn, because Jessie is growing up and has found herself a boyfriend, so their sisterhood is changing. 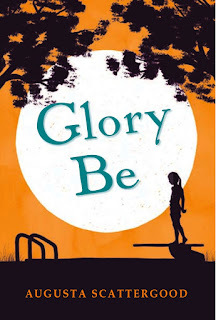 Throughout the change in this short summer, Glory comes of age and stays true to what she believes and learns more about herself and those in her town. I’m torn about my review of this book because it had an interesting historical setting, but I didn’t love the main character. I also felt like the historical parts of this book needed to be explained, it was assumed that the reader knew what was going on in Mississippi during this time in the Civil Rights Movement and I don’t think the young audience this book was directed towards would have that kind of knowledge base. To me this book was almost good, it was almost really good, but it was missing the character development that would have made it great. EL (4-6), MS-OPTIONAL. Reviewer, C. Peterson. 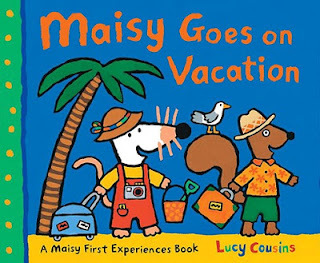 Cousins, Lucy Maisy Goes on Vacation Candlewick Press, 2012. $6.99 PICTURE BOOK Content: G.
Maisy packs her bags to go on a beach vacation. She meets her best friend, a squirrel named Cyril, at the train station where they board the train together. As they are traveling, Maisy colors and Cyril buys treats. When they get to their hotel they put all their stuff in the hotel rooms and then get ready for the beach. While at the beach they play in the water and the sand all day. They end the day by sending postcards to their friends and then they go back to their hotel room to bed. The storyline is simple and easy to follow with matching illustrations. Young readers will like following Maisy on her trip to the beach with her friend. The colorful illustrations are bright and they keep young readers attention. PRE-K, EL (K-3)-ADVISABLE. Reviewer, C. Peterson. Dotlich, Rebecca Kai What Can a Crane Pick Up? Illustrated by Mike Lowery Alfred A. Knopf, 2012. 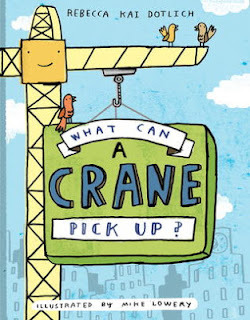 $16.99 PICTURE BOOK Content: G.
This is a rhyming tale about the machine a crane. 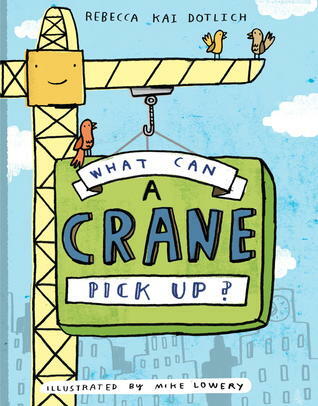 The book covers all the basics of what a crane can pick up: trucks, trains, supplies and buildings. And then it gets silly and talk about crane’s picking up cows, boxes of underwear and men in business suits. At the end, it says to be careful because a crane can also pick up you. This is a fun read-aloud because the rhyming sounds similar to a Dr. Seuss book. It is also entertaining as well as informative about what cranes can do. My biggest complaint is that the illustrations and the text get jumbled together and so it’s sometimes hard to tell what order to read the text. Also, the illustrations are elementary and simple, and not as cute as the rhyming story. 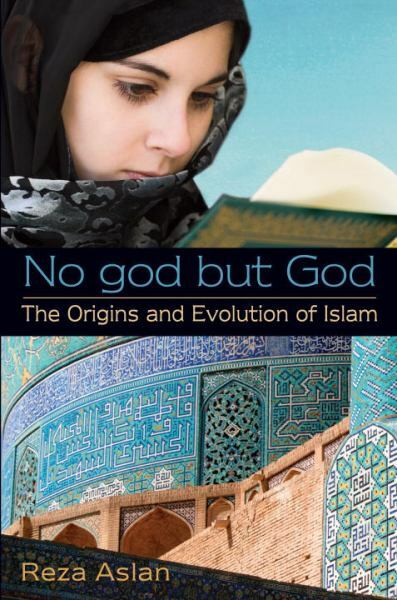 This nonfiction book presents the history of Islam in chronological order. Most of the book is focused on the life of Muhammad and his teachings. Then, there a short briefs on each of the successors and the following splinter groups. The final chapters deal with three current issues in Islam: the meaning of Jihad, Islam- Jewish relations, and women in Islam. Aslan writes a clear and concise history on Islam. He clarifies the word, Jihad, and the correct role of Jews and women in Islamic society. This book is an abridged version of his adult book entitled “No God But God”, which was listed as one of the hundred most important books of the past decade. 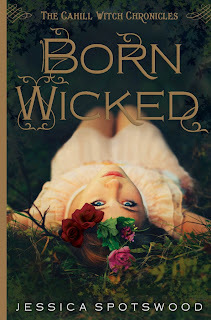 Spotswood, Jessica Born Wicked, 326 pgs. G.P. Putnam’s Sons, 2012. $17.99 Content: Language: PG (8 swears); Mature Content: PG-13; Violence: PG. Cate Cahill and her two sisters live with their scholarly father in a country house during the late 1800s. Ever since Cate’s mother passed away Cate has been in charge of teaching her younger sisters how to contain their magic and hide their true witch identities from the town. The Priests of the Brotherhood are a council of strict men who are constantly on the lookout for witches and they are not afraid to put to trial anyone remotely suspicious. Regardless of Cate’s efforts, Cate and her sisters are labeled eccentric and her father hires a governess to teach them how to fit in better, but the governess is more than she seems and is searching for three sisters from a prophecy and the Cahill sisters fit the bill. On top of her witch trouble, Cate’s best childhood friend has returned from college and wants Cate to marry him, but she is beginning to have feelings for the gardener. Cate has sisters to protect and she will sacrifice anything for their safety, even her own heart. The characters in this book draw you in and you can’t put the book down until you find out what happens to them. However, the ending is open to a sequel and all the answers you quickly read the book to find cannot be found in this book. I can’t wait for the sequel, but I was frustrated at the lack of an ending. The character development and setting make this an intriguing series that I will follow to the end though. MS, HS-ADVISABLE. Reviewer, C. Peterson.